Finding the perfect gift for your loved ones during the holidays is never easy and filling up their stockings with things they’ll actually use is tricky. 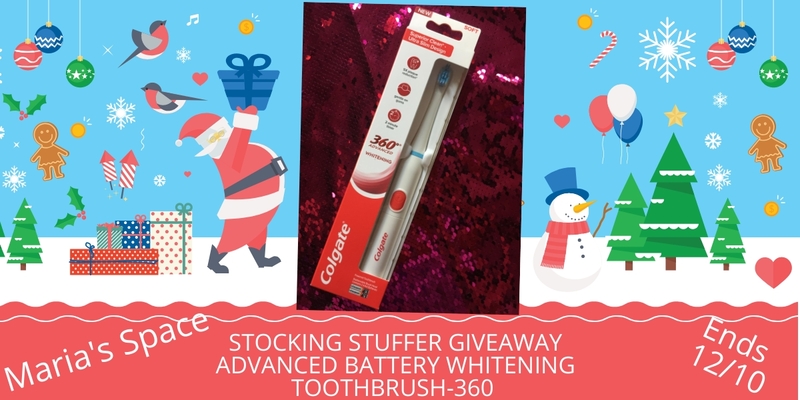 Colgate is helping to take the guess work out of your holiday shopping this season with their new 360 Advanced Battery Whitening Toothbrush. This new toothbrush is lightweight and slim in design making it easier and more enjoyable to get a brighter smile. With 5X more plaque removal than a manual brush and a 2-minute timer, you’ll not only be gifting a better smile this holiday season, but also a better clean. Every year I put a new toothbrush in my kids stockings. There is nothing like a new one and since we change them every few months they are always excited to get a nice, new shiny one. It is the little things. I remember my parents use to put one in my stocking every year. This year they are getting the new Colgate 360 Advanced Battery Whitening Toothbrush. I love that it has a timer on it which means more brushing. This toothbrush takes 2 AAA batteries which comes in the box with it. It has soft bristles and a slim design is easy to clean and also has a cheek and tongue cleaner which is something I use to always remind the kids about when they were younger. It sells for around $12.99 and you can get it at CVS, Dollar General, Target and Walmart, just to name a few. You can even get replacement heads at Amazon (2 pack). Happy Brushing! Your Dentist will thank you. 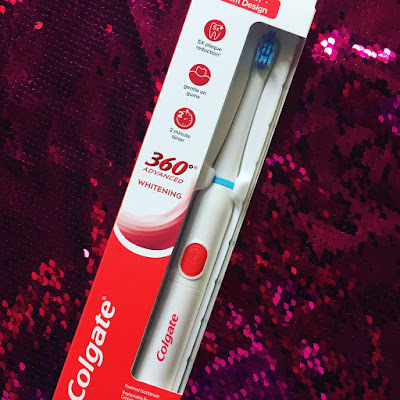 Colgate has sent me one for a giveaway as well....enter below. We get a new toothbrush every year! No,I never got a tooth brush in my stocking,It's a great idea,I'm definitely going to include a tooth brush in my kids stockings. No I never got a toothbrush in my stocking. I have never gotten a toothbrush in my stocking. No I never gotten a toothbrush but I wouldn't mind. Yes I get one every year. Santa always put a toothbrush in our stockings when we were little. (and now I put them in my kids' stocking). I get our grandson a new spin brush for his Christmas every year. He likes those cute character ones like spider man or something like that. I'm not certain, but I think my parents did that once or twice when I was a kid. I *have* received things like a Waterpik and dental hygiene items for Christmas because I ask for them! No, I never got a toothbrush in my stocking but love the idea especially for my 2 grandkids. Always put toothbrushes in our stockings! Thanks for the chance! Yes, sometimes I get a toothbrush. I don't think I have ever gotten a toothbrush in my stocking. I'm sure I did but it's been a long time since I was little. I did get some disposable toothbrushes from my sister in law in a Christmas present and I thought it was a great idea. Yes, I usually get one in my stocking. Ive never gotten one in my stocking before.